We are pleased to announce that our STAFIX®GRIP -product range expands with a new product suitable for Offset -printing. This new addition brings a much waited, cost effective solution for the STAFIX®GRIP range for larger print volumes. You can order a free sample folder of the new material here! STAFIX®GRIP OFFSET -sheets will be available in white and clear and are specifically designed for UV-Offset printing. Additionally, the white material can be printed with Traditional Offset using oxidative inks. Both the white and clear sheets are available in the format of 707x1000mm. Additionally the white material is available in the sheet size of 450x640mm. You can download the product data sheet here. For more technical information and tips for printing please see the product page here. 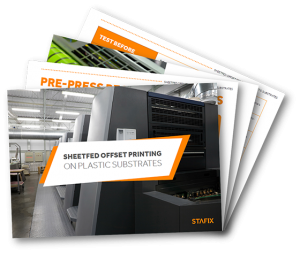 Don’t forget to download our “Sheetfed Offset Printing on Plastic Substrates” -ebook!